The Journey is the first of a series of movies on the Book of Mormon. This first installment was almost as painful as reading through the Book of Mormon itself. The story as well as the acting were both overall awkward and less than compelling. It came across as another cheesy religious movie. For those not familiar with what the Book of Mormon essentially is about, it begins in Jerusalem around 600 BC. The Lord directed a particular prophet/street preacher named Lehi to take his family out of Jerusalem and go to the land the Lord promised them. That land eventually ended up being none other than the Americas. The family broke off into two warring nations--the Nephites and the Lamanites. The main character of this movie, Nephi (Noah Danby), led the former, and his brother Laman (Mark Gollaher) led the latter. The Book of Mormon itself is primarily a record of these two warring groups and their interaction with the divine, which culminates in none other than Jesus Christ coming to reveal Himself and preach His gospel to these "lost sheep of the house of Israel." This first movie though only shows visions of Christ's future coming to Israel and then to the Americas. The movie begins with a prefatory written message claiming that the LDS Church neither sponsors nor endorses this movie. It also states that the story is based on actual events that occurred in the Book of Mormon. The only evidence given for this claim is apparently subjective. In the very early stages of the movie, the angel Moroni tells the young Joseph Smith, Jr. in 1823 that at the end of the book is a promise that God would manifest the truth of it if one sincerely asks, and this is commonly understood by LDS as a "burning in one's bosom." This is an internal confirmation by the Spirit. Now of course this is not an historical documentary in which the various objective evidences may be cited, but the viewer needs to realize that there is not any real objective evidence that can be given. Of course it is not a problem to verify the existence of Jerusalem during this time period, but there are no sources for Lehi and his family, their voyage across the ocean to the new promise land, nor for the communities that were established by them. There is no reason to think a compass was in existence during this time to help Lehi and his family navigate around. There is no DNA evidence that has discovered any native Americans being of Israeli or Middle Eastern origin (despite how large these tribes supposedly later became in the Americas), nor is there any evidence that one of these groups became "dark" while the other on remained "white." Is it possible these things happen? Certainly, but the viewer (at least the non-LDS viewer) is still left wondering why any of these things are related to "actual events." Why isn't this something more like Alice in Wonderland, The Lord of the Rings, or some other fairy tale? For more on the archeological problems with the Book of Mormon see here, here, here, and here. dark skins being given to the Lamanites and others as a curse for their own wickedness (2 Nephi 5:21 ff. and Alma 3:6 ff.). In the 2 Nephi 5 passage, verse 21 says that God did this so they would not be enticing to his people, and verse 24 says that this "cursing" of darkness on their skins drove them into idleness, mischief, and subtlety. Both 2 Nephi and Alma 3 passages also imply a forbidding of interbreeding between white and dark races with the resulting seed inheriting the same curse (2 Nephi 5:23 and Alma 3:9). Finally, 3 Nephi 2:14-16 says that as the Lamanites repented and joined themselves with the Nephites, their curse was removed so that their "skin" became "white" and "exceedingly fair" as the Nephites' skin (Racism in Mormonism). The final scene has Joseph Smith, Jr. crying. Now the viewer must interpret why he is crying. Was it simply because he was melancholy about the family separation, or was it because he discovered that these early Americans and even God were racists? It was probably the former, since Smith was such a promoter of the Book of Mormon. One final thing that is puzzling is how these Israelites were depicted in this movie. It is striking how many clean-shaven Israelite men were walking around Jerusalem. But more importantly is how bare-chested the men were... particularly the God-fearing Israelite Nephi. This is not only the case here, but also in other paintings the LDS Church has of the righteous Nephites. Solomon's temple had been built many years before the Nephite time period, so if the LDS position were correct, would not we expect them to be wearing their temple garments? Or are we to believe that they were simply more lax about the regulations of wearing them back then? There are three positives. The first is the music was fairly well done. Robert C. Bowden composed it, the Prague Philharmonic Orchestra performed it, and Thomas C. Baggaley, Aaron Merrill and Kurt Bestor had orchestrations. The second is the occasional scenery shots of the New World were quite beautiful. The third is that this series of Book of Mormon movies undoubtedly will be effective in helping the stories come to life for those who have already read the book as well as for those who have not. This is particularly important given what has already been said about the lack of evidence for such an incredible story. 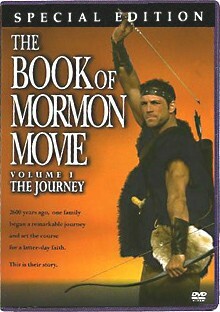 Finally, for more reviews on this Book of Mormon movie, click here.